I read this article and found it very interesting, thought it might be something for you. The article is called How To Stop WhatsApp Sharing Your Info With Facebook and is located at https://www.ben-johnston.co.uk/stop-whatsapp-sharing-facebook/. Although the way they phrase it in their blog post frames this change as benevolent, allowing them to alert you to fraudulent bank transactions and other ways in which you interact with businesses, it’d be pretty naive to think that this is the main reason behind it. It’s all about ad-targeting and usage measurement, kids. Yes, I’m aware of the irony of me saying this considering that’s a big part of what I do for a living. That said, that’s not why I’m writing this post today, or even why I think you should opt out of this. The reality of life in the 21st century is that ads are targeted. It’s just the way of the world, and it’s not usually as intrusive or creepy as some people believe (even though it’s still really annoying when it’s done wrong). No, the reason you should opt out of this is simply due to the risks to your privacy and, in some cases, safety. 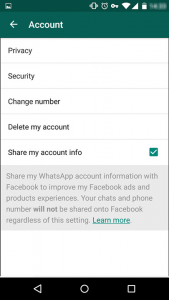 Excluding all the fear-mongering about Facebook potentially having access to your conversations (it’d certainly make my Facebook ads more “interesting” if so), the key issue here is that if you choose to share your WhatsApp account information with Facebook, your ads will be even more targeted. It can also make your Facebook account much easier to find, even if you’ve used a different name to avoid certain individuals or groups. This is obviously something that people – particularly young women – should be wary of. I’m friends with quite a few people who use pseudonyms or different names on Facebook as they’re trying to avoid certain people for one reason or another. 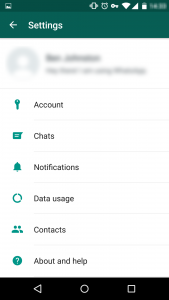 If they linked that individual’s phone number with WhatsApp at any point in the app’s seven-year history, or vice-versa, they will show up in the suggested friends list. There’s also the overall concerns about data protection and privacy. The UK’s Information Commissioner’s Office is currently investigating the change to ensure that it complies with our (massively outdated) data protection act and I personally have a number of concerns about it. Although WhatsApp states that conversations are still encrypted, meaning conversations can’t be read, giving the metadata over to Facebook still allows them (and, by proxy, governments and law enforcement agencies who fill in a request) the ability to see who you contact and the frequency behind it. Link this up with your Facebook information such as your broader online activity, group memberships or perhaps political affiliations, and that may well be a risk for some people. For most people, this isn’t a worry yet, but the ever-increasing amount of data companies and our governments are gathering about us and our behaviour does concern me, especially since everyone seems so blasé about giving it over for free stuff. Again, yes, I’m aware of the irony of my saying this. By disallowing the linking, you can’t completely escape this. The only way to do that is to uninstall WhatsApp and delete your account (I recommend Signal), but you do avoid ad-targeting and the Suggested Friends bit. Your usage statistics will still be shared with Facebook and, by proxy, Instagram and Oculus Rift. Here’s how you stop the linking. Be advised, if you’ve already accepted the new terms and conditions without reading them, or you’ve just signed up for a new account, you only have 30 days to do this. It’s a pretty simple process but it’s not immediately obvious. First, go to your WhatsApp Settings and tap “Account”. At the bottom of the page, you’ll see “Share my account info”. Pre-ticked, as well. Gotta love that opt-out rather than opt-in, right? Untick that box. It’ll try and guilt you into staying. Don’t fall for it! Do My Facebook Friends Have My WhatsApp Phone Number? Something I’ve seen doing the rounds about this is that it means anyone on your friends list gets access to your phone number if you allow the two apps to link. That would obviously be a major concern and if that were true, I’d be calling for everyone to uninstall it now. As far as I can tell, this isn’t the case. I’m not a lawyer, and I don’t often pretend to be one on the internet, but it seems pretty clear in the new terms and conditions that this isn’t what’s happening at this stage. Will it happen in the future? Potentially. In fact, considering how far WhatsApp have backtracked on their previous promise of never sharing or selling your data, I wouldn’t be shocked to see this happen pretty soon, but it’s not happening at the moment. More targeted ads, better friend suggestions and “improved user experience” along with “improvements in the ways you deal with businesses” might not sound like a big deal right now, especially if you’re of the mindset that “I have nothing to hide so I have nothing to fear”, but I really think this is the tip of the iceberg for Facebook and WhatsApp and I can see a number of risks, especially for vulnerable people or those who aren’t that savvy around their privacy settings. Now sign up for my email list and give me your tasty datas, yeah?